Tap Mail→All Inboxes or one of the account-specific inboxes. Tap the Edit button in the upper right corner. Empty circles appear to the left of each message. Tap the circle next to the messages you want to delete, move, or mark. 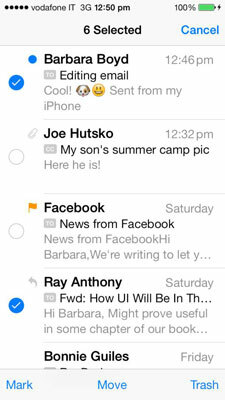 A white check mark in a blue circle appears and the number of messages selected is indicated at the top. Notice that although it appears only two messages have been selected, the first one is a thread so there are actually six messages selected because all the messages in the thread are selected. Whatever action you take will affect all the messages in the thread. After you’ve selected all the messages you want, tap the appropriate button: Mark, Move, or Trash. Tapping Mark lets you flag the messages, in which case a little flag waves next to the message in the message list, or mark them as unread, which re-places the blue dot next to the message that indicates unread messages. 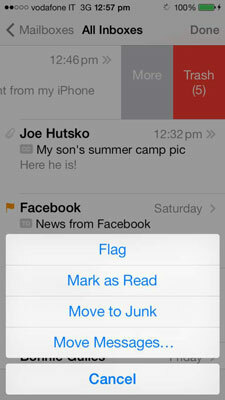 Repeat the steps to Unflag or Mark as Read messages that are flagged or marked as unread. Tapping Move opens the filing options Tapping Trash, well, that eliminates the selected messages. You can also swipe on the message in the list to act on it. Tap the More button to see the options. Tap the Trash button to delete it. If you swipe a thread, the action affects all messages in the thread. If you want to act on individual messages within a thread, tap the most recent message to open the thread, tap Edit in the upper right corner, and take the same actions as explained previously. Tap the button in the upper left corner or swipe right to return to the Mailboxes list. Tap the name of the account you want to work with in the Accounts list, not the Inboxes list. Tap the Trash button, which looks like a trashcan. If Archiving is on, instead of the trashcan, you see an archival box icon. The Delete All button at the bottom of the screen is activated. Your messages are truly deleted. But wait! What about that Mark All button or the grayed Move button? Tap Mark All to mark all the messages in the list or tap in the empty circles to the left of the messages you want to remove from the mark, move to another folder, or delete. The buttons change to Mark, Move, and Delete. Tap the Move button to put the selected messages in the folder you want or the Mark button to flag, mark the messages as unread, or move to the Junk folder. Tap Delete to delete only the selected messages. Likewise, you should tap into the Junk folder every now and then, tap Edit and then tap Delete All there too.